Choose from options like ultrasonic sound, motion sensor, remote control, a strobe light and a blaring alarm (and don't worry, you can turn those on or off). UltraSweep sets up anywhere in about 5 minutes, and covers up to 5,000 square feet. Prevent costly damage to your home and property, including your yard, garden, vehicles, RV, attic, roofing, insulation and electrical wiring. Breathe easy knowing your family won't have to use toxic chemicals, dangerous poisons, or messy traps. Run your UltraSweep continuously, use a motion sensor, or use the keychain remote for on-demand activation. 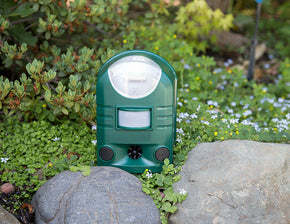 The device you see here has been the most popular indoor/outdoor pest repeller on the market for the last decade. Good Life revolutionized the ultrasonic pest control industry with this humane, yet powerful device and its remote control feature. The UltraSweep Outdoor emits powerful ultrasonic and sonic sound frequencies that bombard the ears of animal pests in an area up to 5,000 square feet. You can run the unit 24/7, or choose the motion sensor option and remote control. The adjustable infrared motion sensor accurately detects pests between 5-100 feet away. An optional strobe light and loud audible alarm make it great for chasing off animal or human intruders. What does it get rid of? Our Select-a-Pest Technology allows you to adjust the sound levels to better target specific pests. Customers around the world have reported success with squirrels, chipmunks, bats, deer, mice, rats, rodents, skunks, possums, armadillos, raccoons, and other unwelcome house guests.